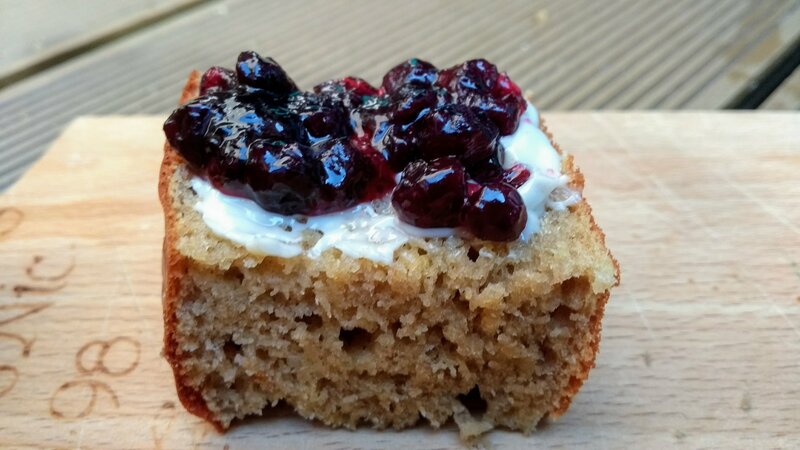 I’ve dabbled lightly with using gluten free flour in baking before but steered toward savoury recipes or pancakes to avoid being duped by the palatability of gluten free puddings laden with sugar. I do have a gluten free lemon drizzle cake recipe on my blog but that is a case in point – it’s so totally delicious and moreish because it contains a ton of butter and sugar! To be honest I’m not too keen on gluten-free flours, the results have always tended to be brick like and unattractive. But today I happened across the gold medalist of gluten free flours judging by the totally spongy cake produced. 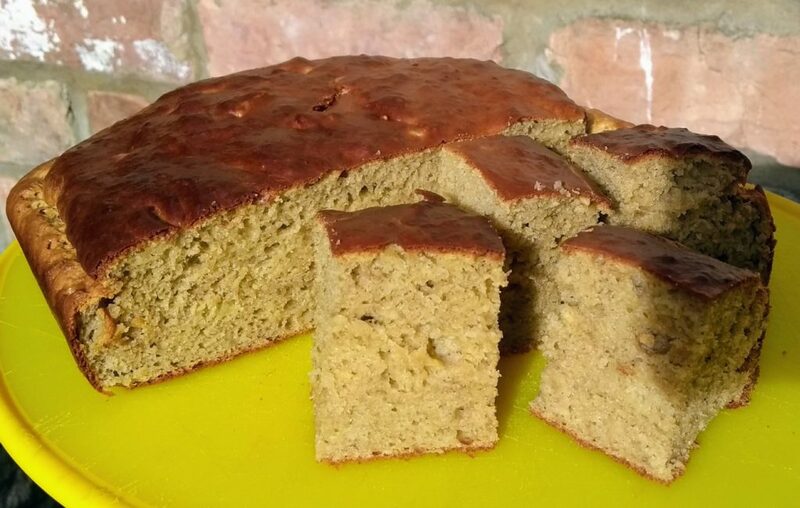 I found this recipe for chickpea flour banana cake on Camilla’s Power Hungry website and the result exceeded all expectations – I never imagined I’d be using the words “light and fluffy” to describe a gluten free cake! As Camilla describes in the comments section of her blog this recipe is intentionally sweetened for a more cake like texture. I always look at the comments from other readers for insights into successful adjustments to a recipe, particularly sugar quanitities, the changing of which can have more than just an impact on the flavour. I thought two bananas would have enough sweetness for a not-quite-savoury gluten-free carb alternative so I only used 2 teaspoons of honey melted with the coconut oil and 2 teaspoons of cashew nut butter (just using up almost empty jars). The result was a terrific texture and not very bananary at all as I only had newly bought firm bananas in stock (I’m guessing it would have tasted sweeter the more ripe the bananas are). Luca and I enjoyed it buttered and topped with jam and I’d happily dunk it in soup too. I shall definitely be using this as my go to base recipe and re-work it with other favourite additions like lemon curd, spicy ginger and grated carrot and walnuts. The other variation I made to the recipe was the addition of Pulsin pea protein powder. Camilla had suggested reducing the amount of yoghurt if using honey instead of cane sugar but as I’d already whizzed mine up I decided adding another dry ingredient would work just as well. 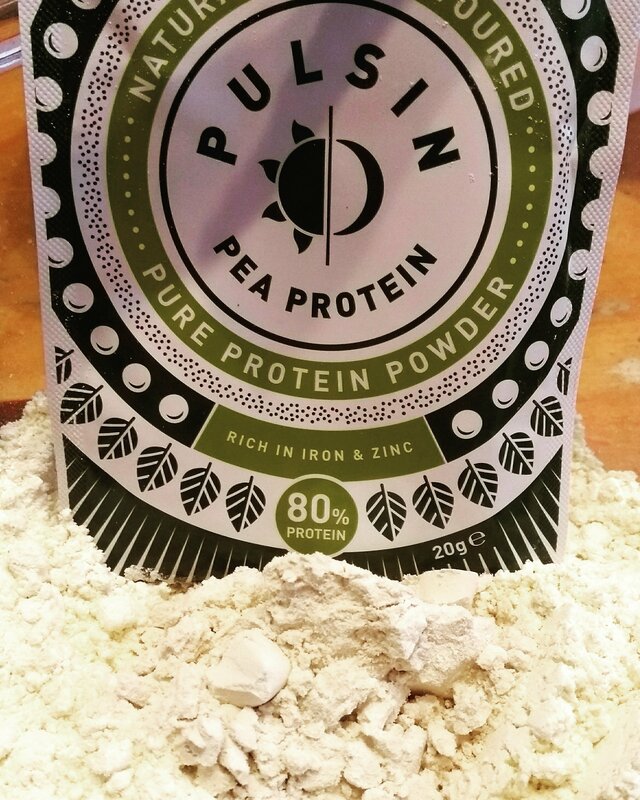 I’m not generally very experimental with protein powders other than blending them into smoothies but as the Pulsin pea protein is flavourless I thought it would be a good opportunity to try it out. You would never know it was there and with no added sugar or sweeteners and 80% protein there’s really no limit to what you could sprinkle the pea protein powder into. It was lovely to do some baking with L. It doesn’t have to be complex cooking with children, a bowl and a wooden spoon suffice more often than not. 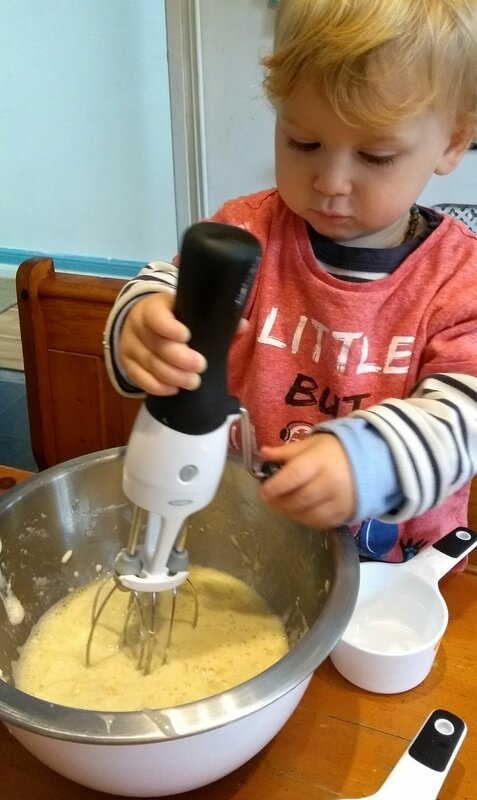 L even had a go with my Oxo good grips hand held mixer which E tried for the first time around the same age. 4 years later stainless steel bowl and mixer still look like new and continue to survive being used in the bath for whizzing up bubbles and as a hat and accessory, as well as for so many different cooking tasks! Preheat oven to 190 degrees C. Lightly grease a 9 inch square baking tray. Mix all the dry ingredients in a large bowl (flour, baking powder, baking soda, and cinnamon). Whisk the eggs, sugar, yogurt, banana and oil in another bowl until well blended. Add the wet mixture to the flour mixture stirring just until moist. Cool cake in the pan for 10 minutes then cool completely on a wire rack. Ooh they do look good, thank you. I did try making sweet corn fritters once but perhaps my batter was a bit thin, they kept exploding like popcorn! Corn fritters might not be designed to explode like popcorn, but sure sounds like fun! I’ve only eaten gluten free cake a handful of times and you’re right – I would never normally describe it as light and fluffy! Glad you’ve found something that works for you!